West Ham is located in Greater London. The seat was created in 1997. The current member of parliament is the Labour Party’s Lyn Brown who was elected in 2005. Rachel Collinson has lived in Newham with her husband for the last 2 years and runs a small business. She has a strong faith that motivated her to get into politics, to protect the environment and narrow the divide between rich and poor. She loves comedy, music and LOLcats. If you follow me on Twitter, you’ll see that I prioritise responding to your questions and concerns. I’ve started as I mean to go on, by being active in the local community and have been helping out with those in need in West Ham such as the Upton Centre and Focus E15 Mums campaigns. I hope that you’ll see my face around and unless I’m dog tired I’m always happy to stop and chat. 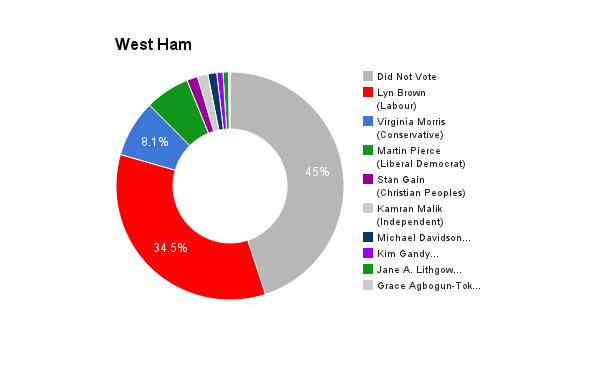 I think West Ham has been taken a bit for granted by a Labour party sliding ever further rightward. We need some new energy, from a candidate who actually believes in building more social housing, renationalising the railways and protecting small businesses and working-class people against the interests of huge corporations. Lyn has consistently voted against the worst excesses of the Coalition government and her attendance in parliament has been good. In 2010 the Green Party predicted that we would have a double-dip recession if the Coalition implemented their planned cuts, and that’s exactly what happened. From this we can learn that cutting government expenditure to grow the economy is like quitting your job to focus on paying off your student loan. We need to be bold and reform the banking system, and reduce the deficit by taxing those who can afford it and investing in our economy. It’s not only vital for the UK but it’s our moral duty to accept refugees from the wars and environmental disasters that we ourselves created. They in turn create jobs and enrich our society. It makes no sense whatsoever to blame immigrants for the problems that bankers and cuts created. We need a living wage. To help small businesses afford this, the Green Party would abolish employers’ national insurance. We also need more affordable housing, and the Green Party would create 500,000 new social homes through refurbishing empty buildings and building on brownfield sites. We would also undertake a large programme of energy efficiency investment to reduce fuel bills for everybody and create jobs at the same time. The NHS is driven by numbers at the moment, and doctors and nurses are finding this incredibly stressful and inhuman. We need to have patient-centred care rather than money-centred care. THe NHS also needs proper investment. To do this, we’d reverse marketisation, saving £10 billion a year, and raise an additional £2 billion by increasing taxes on alcohol and tobacco. There is a skills shortage in this country, and to address this we need decent free education – a right not a privilege. Also, mental health problems prevent a huge number of people from seeking and keeping a job. 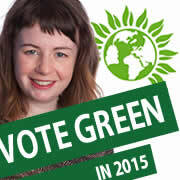 The Green Party would prioritise treatment. We also need investment in job creation, with support for small business and infrastructure investment. I love the Green Party’s detailed plan to created a million jobs over the next 5 years. YES, absolutely! Most politicans have no idea what it’s like for ordinary people. You only need to look at the champagne bill in the Commons bar to see how out of touch Parliament is with reality. I believe a referendum will be a great thing for our country, allowing us to finally settle the matter once and for all, and communicating to the EU how urgent the need is for reform. I would encourage my constituents to vote yes, because Europe has brought us peace for the last 60 years and that is very precious.